If there is one Edmonton Oilers prospect looking for a mulligan from 2015-16, it’s Anton Slepyshev. The 22-year-old Russian forward started the season with plenty of promise playing with Connor McDavid on the Oilers top line. From there, his year went into a tailspin and he found himself floundering in the AHL. In 2016-17 Slepyshev will be looking to rebound. The 88th overall pick from the 2013 NHL Draft scored just one point in 11 NHL games and was re-assigned to the Oilers AHL affiliate in Bakersfield shortly after. He struggled to find his footing through 49 AHL games scoring just 21 points. It was a forgettable year, and Slepyshev will be battling for a top-six role in training camp with the Condors, not the Oilers. It’s been a humbling experience, and after Bogdan Yakimov returned to the KHL this summer, Slepyshev is now the Oilers only Russian-born prospect slated to play for the Condors in 2016-17. When Slepyshev was drafted, then-Oilers GM Craig MacTavish pegged him as a sleeper pick that could be a steal for the team. After two modest years in the KHL playing for Salavat Yulaev Ufa where he scored 14 points in 47 games, the Oilers signed Slepyshev to a three-year entry-level contract (ELC) in May 2015. Slepyshev came out of the gate last year, as said, after an impressive camp with the Oilers. 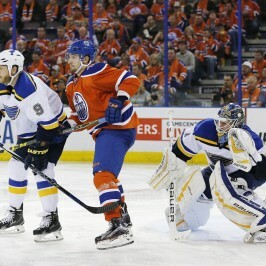 Due to the Jordan Eberle shoulder injury, he found himself with an immediate opportunity in the Oilers top-six. In the season-opener against the St. Louis Blues on Oct. 8, he played 14:19 TOI, a season-high for him. He then saw his ice-time dwindle significantly to a season-low 4:23 TOI in just the sixth game of the year on Oct. 21 against the Detroit Red Wings. In his entire 11 NHL game stint with the Oilers, he was limited to just five shots on goal. The belief was that Slepyshev would slot himself into a position that would see him as a frequent recall, getting top-nine minutes, but he’d actually end up spending a majority of the year in the AHL. A lot of what happened last year was because of the Oilers poor depth up front and an injury situation which put Slepyshev in a role he wasn’t quite ready for. He got boxed out in the offensive zone, struggled to create a net-front presence and found himself playing on the perimeter. The easy answer is to say Slepyshev struggled to adjust to the North American style and ice. Slepyshev will need to rekindle some of that offensive creativity he had in the KHL and find a way to apply that within the Condors system. He lost his creativity and in turn lost his confidence. People get trapped looking at the overall statistical boxcars for Slepyshev in the AHL. When analyzing the numbers deeper during his 49 game stint with the Condors you have to look at those in two parts; before and after his injury. In his first 20 AHL games, he put up just four goals and five points. After returning from injury, he finished the final 29 AHL games with nine goals and 16 points. That’s a points-per-game improvement from 0.25 to 0.55 or the equivalent of 37 points in a full 68 game Condors schedule. According to HockeyDB, those numbers would’ve made him a bonafide top-six player with Bakersfield. Related: Who is Anton Slepyshev? 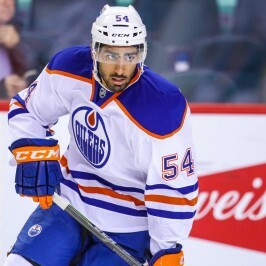 Jujhar Khaira (22) – An improving power forward that fits well into the Oilers future bottom-six. Put up 27 points in 49 AHL games. Joined the Oilers in late-November and was returned to the minors in March. Impressed upon head coach Todd McLellan and gained a lot of trust with the coaching staff for his responsible play as a bottom-six rookie. Drake Caggiula (22) – A prized College free agent signing this summer, he moved ahead of Slepyshev when he signed and will be someone Slepyshev has to outplay to get NHL recalls consistently. Jesse Puljujarvi (18) – The Oilers fourth overall pick in the 2016 Draft. He’ll get every opportunity to make the Oilers and play a top-nine role. That said, it’s entirely possible the Finnish forward ends up playing a starring role with the Condors, similar to what Mikko Rantanen did with the AHL San Antonio Rampage. Rantanen was the co-winner of the AHL Rookie of the Year honors; Puljujarvi can do it in 2016-17. Tyler Pitlick (24) – An RFA at the end of the year, Pitlick is running out of chances in Edmonton and staying healthy will be a huge factor in him staying with the organization past this season. The former second-round pick in 2010, Pitlick has struggled to stay healthy thus far in his career and was limited to just 37 AHL games last year. He put up 21 points, almost parallel numbers to Slepyshev had the latter played all year the way he ended the year. Taylor Beck (25) – A free agent signing that wasn’t qualified by the Nashville Predators. He’s in direct competition with Slepyshev for top-six minutes in the AHL. An offensive player that can play all three forward positions, though he struggles defensively. Will need to develop some consistency, similar to Slepyshev in that sense. Jere Sallinen (25) – A former sixth-round pick with the Minnesota Wild. Sallinen went to Europe, showed a two-way prowess and could develop into a bottom-six energy player for the Oilers. Has tremendous skating abilities and finishes his checks. Patrick Russell (23) – Someone Slepyshev is playing ahead of on the depth chart that could make up some ground. Had a decent offensive year in college and had the potential to be a reliable two-way scorer in Edmonton’s top-nine, will likely play middling minutes with the Condors this season. It’s a competitive list for Slepyshev, but the Oilers haven’t given up hope on the prospect one year into their deal. Nor is this a prospect that fans and management should want to pass on. Slepyshev still has some decent offensive upside as a top-nine forward in the NHL. He’s an incredibly offensively gifted forward that has tremendous hockey sense. He finds space in the neutral zone very well, and it would help if he carried the puck with some confidence. He had a solid junior career and was a huge piece for Team Russia at the 2014 WJC, scoring seven points in seven games and captaining the team to a bronze medal. Adding to that, he’s a former first overall pick in the KHL Draft. This is a new year and Slepyshev will want to put the should’ve, would’ve, could’ve argument behind him. Watch for a bounceback year.